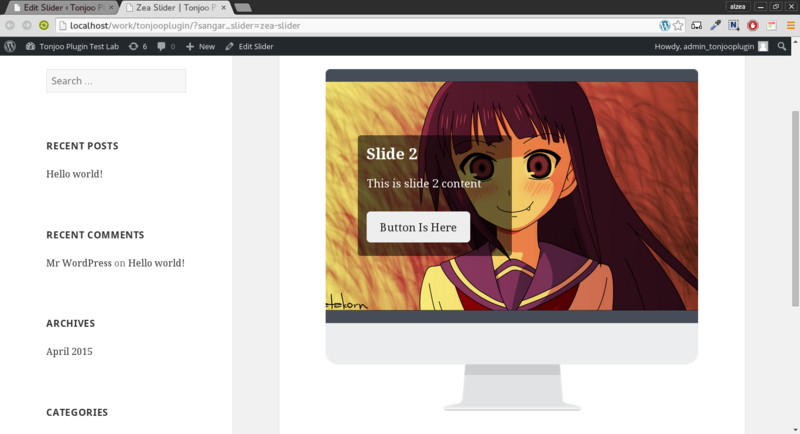 This documentation is made for developers to show how to create custom Sangar Slider Template. If you are NOT a programmer, please read the End-Users Documentation, you don’t need to follow any of the instructions here. Attention: The following manual may use programming terms without offering detailed explanations for non-programmers. In this documentation you will find out the things you need to know about how to create your own custom Sangar Slider template. You will find guidelines to API and step-by-step tutorial. In this tutorial, we will create our first sangar slider template. Altough this template will be very basic, but it will cover everything you need to know to create your own template. 1. Create your template folder inside sangar-slider>template‘s folder. You can name it whatever you want. But in this tutorial, lets name it “my-custom-template“. 2. 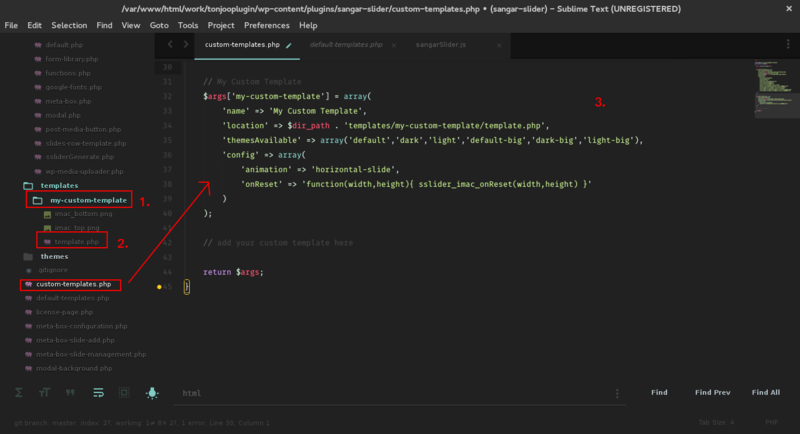 Create template.php file inside “my-custom-template” folder. You can name it evertything you want, but again for convention purpose, let’s just name it template.php. 3. Your registered config option inside sangar-slide>custom-templates.php file. We will cover about registering config options in this tutorial. Now, let’s create our first template. The first thing you need to do, is registering your template. Registering your template is easy, just put your config option code inside the sangar-slider>custom-template.php’s file. You don’t need to create another file, just put your register code in there. You will also find example custom template registered there for your starting point. 2. Location of our template.php file. You can put your template.php file anywhere, and even rename it. But for convention purpose, we will use default name and folder structure. 3. What themes do want to include inside your template. Sangar Slider provide several themes for your custom template use. 4. Your config options. This is how your template behave. Sangar Slider providing rich options API (about 42 options in total) to create custom, flexible and robust slider template. Just copy and paste your necessary config option, and see how it works! You can see our full config options later on this tutorial. 1. Create your template folder inside sangar-slider>templates. In this case, we name it my-custom-template. This is must-have and the most important lines of our code. This line is for calling sangar-slider core class. This is just plain CSS code. Because in this template, we are using 2 assets. Which is imac_bottom.png and imac_top.png, and we need to styling those assets to fit our slider properly. This is jQuery function for images/assets width. So our assets width (imac_bottom.png & imac_top.png) will fit and match with slider width. Even if we resize our slider, it will keep responsive. This is the important piece of code. In this code, we are calling our slider options. Before you do that, you need to create your template boostraping first (We already registered our template and setup our options). Here we call our first image assets (imac_top.png), using img src tag. Here we call our second image assets (imac_bottom.png), using img src tag. You can use this config options inside your template boostrap (See point A), to define slider behavior. In this tutorial, we will learn a bit more advance topic about Sangar Slider API. Which is Filter Hooks. With this filter hooks, you can integrating Sangar Slider with almost every WordPress themes/plugins, or even your very own WordPress theme/plugin. A Hook is a generic term in WordPress that refers to places where you can add your own code or change what WordPress is doing or outputting by default. Two types of hooks exist in WordPress: actions and filters. We will cover these code line-by-line later in this tutorial. For now, lets just make sure we understand that, we can hooks our sangar slider custom template anywhere we want it to be, as long as we define our exact custom template location. So sangar slider can detect and show it properly. 1. Create new folder inside your theme. In this case, we name it “sangar-slider-template” and we are using twentyfiffteen theme. This is the important piece of code. In this code, we are calling our slider options. Before we do that, we need to register our options first (We will cover that later on this tutorial). Line 4 : Define variable of $dir_path with our current theme path. So we can create shortcut to our absolute template path. Line 7 : Define our custom template arguments (or options) using array approach to creating an action. Line 8 : Name of our custom template. You can name it anything you want. Line 9 : Location or absolute path of our custom template file (in this case, template.php). You can put your template files anywhere you want, as long as you call its absoulte path inside your template arguments. Line 10 : Same as locations. But this is for your custom sangar slider theme location (notice, theme is not template). Theme is your CSS file for template sytling. Line 2-14 : In here, we choose what config options we are going to use by our slider (You can see full list of config options on point C on this tutorial). Line 15-17 : On this line, we tell the slider to trigger JS callback functions on slider initialization. In this case, we want to show console log message when slider is on init. Line 18-20 : Now tell the slider to show console log message “Do loading…”, when beforeLoading functions is triggered. Line 21-23 : After loading is done, tell slider to tigger another JS callback functions, which is show console log message “Loading is done”. Line 24-29 : When our first slide is show up, sangar slider will trigger another JS callback functions. This time it will show console log message with number of active slider.